Featured image: This map was published by Robin Wright nine months before the offensive by Daesh into Iraq and Syria. According to this Pentagon researcher, it rectifies the map published in 2005 by Ralf Peters for the reshaping of the Greater Middle East. While the Syrian Arab Army, the Russian aviation and Hezbollah are preparing to finish off Daesh, the Pentagon is planning a new war against Syria, this time with Kurdish troops. Just as the mission of the Caliphate was to create a Sunnistan straddling Iraq and Syria, so the mission of “Rojava” is to create a Kurdistan straddling the two states, as the Pentagon has been publicly stating for the last four years. According to US grand strategy, as defined by Admiral Cebrowski in 2001, and published in 2004 by his assistant Thomas Barnett, all of the Greater Middle East must be destroyed except for Israël, Jordan and Lebanon. Consequently, the imminent victory against Daesh will change nothing of the Pentagon’s intentions. President Trump is against the manipulation of the jihadists. He has stopped the financial and military support that his country was giving them, and has managed to convince Saudi Arabia and Pakistan to do the same. He has modified NATO policies in the matter. However, nothing yet hints as to whether or not he will also oppose the Pentagon’s grand strategy. As far as the US Interior is concerned, the whole of Congress is in league against him, and he has no possibility of preventing a procedure for destitution other than negotiating with the Democratic Party. Donald Trump has composed his administration of ex-senior civil servants from the Obama administration, a number of opportunistic politicians, many improvised representatives, and very very few trustworthy personalities. His special representative against Daesh, Brett McGurk, is an ex-collaborator of President Obama, and is supposed to serve Trump’s new policy. On 18 August, he organised a meeting with the tribal leaders to “fight Daesh”. However, the photographs he published attest to the fact that, on the contrary, several of Daesh’s leaders also participated in the meeting. In the same vein, helicopters of the US Special Forces exfiltrated two European leaders of Daesh and their families from the outskirts of Deiz ez-Zor, before they could be taken prisoner by the Syrian Arab Army on 26 August. Two days later, they also exfiltrated about twenty more Daesh officers. Everything looks as though the Pentagon were storing away its jihadist structure and conserving it for other operations elsewhere. Simultaneously, it is preparing a new episode against Syria with a new army, which, this time, will be composed around Kurdish forces. This war, like the war against the Caliphate,was announced four years ago in the New York Times, by Robin Wright, a researcher at the US Institute of Peace (equivalent to the NED for the Pentagon). 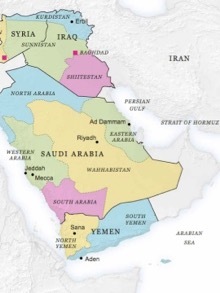 It also planned to divide the Yemen into two states, potentially shared between Riyadh and Abu Dhabi – and finally, last but not least, to dismember Saudi Arabia. Meanwhile, the “Rojava” project corresponds to Israëli strategy, which, since the end of the 1990’s and the development of missiles, is no longer concentrated on controlling its border regions (the Sinaï, the Golan and South Lebanon), but on taking its neighbours from behind (hence the creation of South Sudan and eventually, Greater Kurdistan). The recruiting drive for European soldiers for the “Rojava” project has only just begun. A priori, it could assemble as many combatants as there were for the jihad, insofar as the members of the anarchist groups which provide manpower are as numerous in Europe as common law prisoners. Indeed, the jihadist network began in French prisons before becoming a generalised “crusade”. It is probable that the recruitment within the anarchist movement will also spread as the conflict goes on. Washington, London, Paris and Berlin, who organised this recruitment, planned in the long term. I use the word “crusade” deliberately, because these wars in the Middle Ages, like the one we have just experienced, were in fact European imperialist operations against the people of the Greater Middle East. It is just as grotesque to claim that there is a link between the message of Christ and the crusades as to claim a link between the Prophet and jihadism. In both cases, the commanders were “Westerners” , and these conflicts exclusively served Western imperialism. The successive crusades bled across two centuries, and the majority of Christians in the Levant fought alongside their Muslim compatriots against the invaders. Not long ago, the French Minister for Foreign Affairs, Laurent Fabius, publicly declared that President Assad “did not deserve to be on Earth”, and confirmed that the jihadists were doing a “good job”. Many young people answered his call by joining Al-Nusra (Al-Qaïda), then Daesh. Today, the French ex-Minister for Foreign Affairs, Bernard Kouchner, publicly announced that France would support the creation of state which would include Iraqi Kurdistan and the corridor to the Mediterranean via Syria. A few young Europeans have already answered this call, and many others will follow. 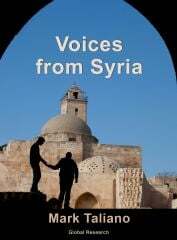 Today, as in 2011-12, the Western Press has taken the side of this new anti-Syrian army, supported by their governments. It will never question the treachery of Abdullah Öcalan, who renounced Marxist-Leninism for anarchy. It will repeat that Kurdistan has already been recognised by the Sèvres Conference, in 1920, but it will avoid looking at the documents which specify its boundaries. It will believe it to be legitimate in Iraq and Syria, although it is currently situated in Turkey. It will ignore the fact that the frontiers in fact correspond to nothing other than the plans developed by the Pentagon. The referendum for the independence of the Iraqi region of Kurdistan and the territories annexed with the help of Daesh will launch the beginning of this operation, on 25 September. 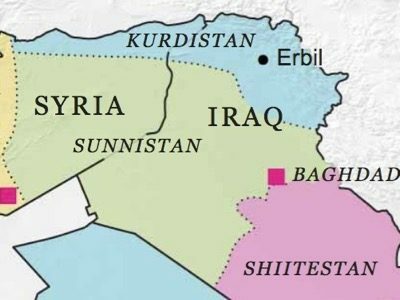 As in 2014, it will be intended to simultaneously destroy Iraq and Syria, this time without creating a “Sunnistan” from Rakka to Mossul, but a “Kurdistan”, on a territory linking Erbil and Kirkuk to the Mediterranean. This term is poorly chosen insofar as “Westerner” is not opposed to “Oriental”, but to “Soviet”. I could find no other term to describe collectively the Europeans, the North-Americans and the Israelis. Author’s note.